UNITED NATIONS -- The United States vetoed a United Nations Security Council draft resolution Monday that was proposed by Egypt and called for the reversal of President Trump's recognition of Jerusalem as the capital of Israel. The U.S. vetoed it in a 14-1 vote, which meant the resolution failed. The vote was held in response to Mr. Trump's announcement earlier this month that the U.S. recognizes Jerusalem as Israel's capital. After the vote, U.S. Ambassador to the United Nations Nikki Haley said the U.S. does not veto resolutions lightly and that this was her first veto -- that it stood for "American sovereignty" and its role in the Middle East peace process. Haley told the Security Council that she has hope the peace process is not dead. 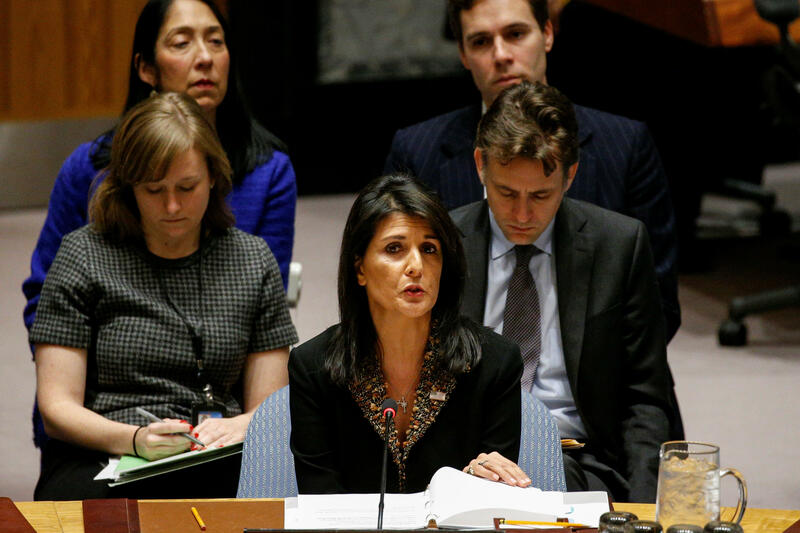 "Our hand remains extended to both parties … We call on all countries that share this commitment to learn the hard lessons of the past and work to bring Israel and the Palestinian people in good faith to the peace table," she said. After the vote, Israel's Ambassador to the U.N. Danny Danon thanked Haley for what he described as a "courageous stance." "Every other country in the world has the right to designate its capital city. But when it comes to Israel, somehow this most basic national right is questioned and condemned," he said. 1 year ago, in this same Security Council chamber, 14 countries voted for a shameful resolution. The US abstained - the resolution passed. Today, 14 countries voted for another shameful resolution. This time the US vetoed. Thank you Amb @nikkihaley for your courageous stance. The one-page draft resolution had expressed regret at recent decisions concerning the status of Jerusalem -- without mentioning the U.S. or Mr. Trump -- and stated that any decisions to change the status of Jerusalem are null and void and must be rescinded. It also called on countries not to establish diplomatic missions in the city. Palestinian negotiators told CBS News that the next step after the Security Council vote will be to bring the proposal on Jerusalem to the General Assembly, under a rarely used 1950 resolution called "Uniting for Peace" that has a provision that would give authority to the 193-nation body to act when the Security Council is deadlocked. Riyad Mansour, the Palestinian Ambassador to the U.N., told the Security Council, "East Jerusalem remains occupied and an integral part of the Palestinian territory occupied since 1967 and is the capital of the State of Palestine, as recognized by the majority of the countries around the world. These are facts." Vote is made: 14 votes in FAVOR and only 1 ONE vote against. The US was the only country in the #UNSC to vote against the draft resolution on #Jerusalem. The point of the resolution, negotiators said, was to show that the U.S. stands alone on the Jerusalem recognition. Before Monday's vote, Egypt's Ambassador Amr Abdellatif Aboulatta, who sponsored the resolution, said that any attempt to change the situation on the ground would have no legal validity and constitutes a flagrant violation under international law, according to earlier U.N. resolutions. The U.N. vote took place amid heightened tensions in the Arab world in the wake of the White House announcement recognizing Jerusalem as the capital of Israel, and as the U.N. is deadlocked on what to do about conflict in the Middle East. Briefing the Council before the vote, the U.N.'s Special Coordinator for the Middle East Nickolay Mladenov discussed issues of violence and terrorism that remain "a hallmark of the conflict," saying 22 Palestinians and four Israelis have been killed during the past three months, adding, "in the wake of the decision of the United States to recognize Jerusalem as the capital of Israel, the situation has become more tense with an increase in incidents, notably rockets fired from Gaza and clashes between Palestinians and Israeli security forces." Haley, who has been a supporter of Israel since she took the U.N. envoy post, said, "For decades, Israel has withstood wave after wave of bias in the U.N."
Both France's Ambassador Francois Delattre and U.K. Ambassador Matthew Rycroft spoke to reporters prior to the Council meeting, saying that their countries would vote for the resolution and saying that the status of Jerusalem must be settled during negotiations. "The United Kingdom will vote in favor of the Egyptian text on Jerusalem because it is in line with our longstanding position on Jerusalem," Rycroft said, adding that the United States continues to play an extremely important role in the search for peace in the Middle East. He called on Mr. Trump to put forward "concrete details, proposals as soon as possible to take that process forward." France's Delattre said, "Because of its unmatched symbolic and emotional dimension, Jerusalem is the key to peace between Israelis and Palestinians. … This is why an agreement on Jerusalem can only be decided by the parties themselves … and not by the unilateral decision of a third country." Following Mr. Trump's decision to recognize Jerusalem as Israel's capital, Haley said in early December the U.S. still has credibility as a mediator with Israel and Palestinians. Peace talks have stalled, although the so-called "Middle East Quartet" still is in place. It includes the U.S., Russia, the European Union and the United Nations. Within hours of Monday's vote, Mansour -- the Palestinian Ambassador to the U.N. -- and a dozen representatives of the Arab Group of U.N. ambassadors, the Organization of Islamic Cooperation, and the Non-Aligned Movement were meeting in the U.N. Secretariat with the President of the General Assembly, Miroslav Lajčák, to call an emergency session of the General Assembly, most likely for Wednesday or Thursday, to bring to a vote a resolution similar to the one presented to the Security Council. Mansour said the General Assembly meeting will be the tenth emergency session called under this provision. "We will continue the pressure in order to create the appropriate atmosphere for the United States to reverse its position and respect the overwhelming support in the Security Council and in the General Assembly," he told reporters.